This rare expression of Napa Valley winemaking is one of only 120 bottles that will ever be made. Think of it as a bit of Napa Valley history in your cellar and celebrated in a glass with friends and family. Your Premiere Napa Valley wine is made solely from grapes sourced from Foley Johnson’s Peral Estate Vineyard in the Rutherford nested appellation. Adobe soils with small amounts of gravelly soil comprise the vineyard. This wine went through 100% malolactic fermentation and is unfined and unfiltered. Full-bodied and concentrated in structure, the wine is indicative of winemaker Brad Warner’s style with juicy and bold flavors. It was nurtured slowly and aged in 100% new and used French oak barrels for more than two years. Brad Warner was born in Sebastopol and raised along the remote coastline of northern California, between the tiny towns of Gualala and Point Arena. He spent much of his childhood outdoors camping, fishing and scouring for abalone. In 1967 Brad moved to the Napa Valley and began his career in the wine industry as a cellar worker for Charles Krug Winery. Three years later he moved to Robert Mondavi Winery to become their cellar foreman. 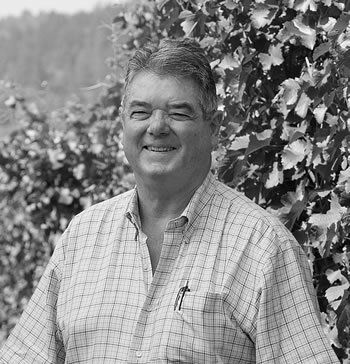 During his career at Mondavi, Brad completed courses in winemaking and business management at Napa Valley College, UC Davis and Stanford University. He remained at Mondavi for 29 years. In 1995 Brad helped Charles and Joanne Sawyer produce their inaugural 135 cases of wine from their property in the Rutherford AVA. “Having vinified fruit from all of Napa, I was thrilled to be working with Rutherford grapes,” said Brad. “To me this is one of the world’s finest areas for Bordeaux varieties. The wines offer exceptional varietal accuracy – Cabernet tastes like Cabernet and Merlot tastes like Merlot. You don’t have the blurring between grapes that can happen in other locales. Today, Brad lives up on Trinity Road, roughly 2200 feet above the Napa and Sonoma Valleys. His hobbies include camping and fishing – holdovers from his childhood. He also enjoys traveling and cooking. He and his wife Lisa have two Boxers, names Beau and Fawn, and five rescue cats. Brad feels that it is uncommon when two people both have the same strong passion and enological values for premium, quality wine making, as he and Bill Foley do.